Take a bowl. Add 2 flours, salt, pepper, ajwain seeds, 2 tablespoon of oil and knead hard dough. Make small balls and roll very thin chappatis of about 5-6 inch diameter. Cut it diagonally into 6-8 pieces. Same way prepare all the nachos. Take a pan and heat oil. Deep fry all the nachos on a low flame in batches. You can also use ready-made nachos. Take a pan and heat butter. Add onions and saute it till it turns translucent. Add ginger-green chillies paste and stir it 2-3 times. Add tomato puree and cook it for about 4-5 minutes. Add salt, pepper, oregano, red chilly powder and mix it properly. Add boiled rajma beans and cook it on a medium flame for about 5-8 minutes, till it is done. Add little water if it is too dry. Take a pan and heat butter. Add maida and saute it till it turns light brown. Add milk gradually stirring continuously to avoid lumps. Let it simmer for 4-5 minutes. Add cheese and mix it properly. Let it simmer for 1-2 minutes more. Add salt, pepper, oregano and simmer for 1 minute. Take a dish. 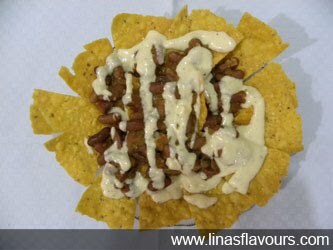 Arrange nacho chips on a plate. Pour beans on it. Top it up with cheese sauce and serve immediately.